Applying to South Suburban Montessori School is a simple process! to see the Montessori philosophy in practice. Applications for enrollment are available during your school tour, and can also be downloaded from our website under the Admissions Forms tab, the Admissions Office, or you can request a mailed application. Previous school records are needed for children with prior school experience. A teacher recommendation is requested for children applying for grades 2-8. 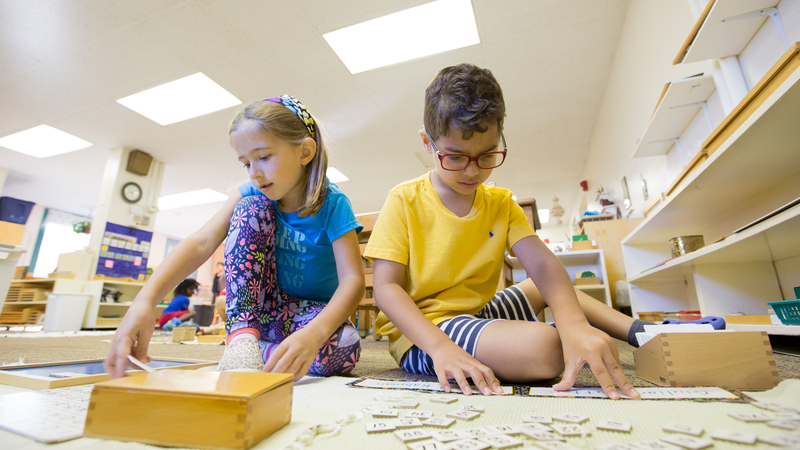 Our student visits are informal and fun, with a teacher working with your child on a prepared lesson and guiding them through the Montessori experience. Student visits occur during the school day for preschool and kindergarten children and after school for elementary and middle school children. Preschool and kindergarten children come for just one visit. Depending on the outcome of the initial after school visit, elementary and middle school students may be invited for a half-day shadow visit to meet other students in the class and see whether our school is a good fit. The goal of our student visit is to determine each child’s needs and whether the school has the resources to meet them. Please note that a student visit will only be scheduled after an application, the applicable application fee, and all required records have been received. A strong relationship between school and home is an essential component of each child’s education. The family interview is the first step in building that relationship. The family interview is scheduled by the Head of School and is an opportunity to determine whether our philosophy is congruent with the family’s and to answer detailed questions about the school year. It’s important for us to meet both parents whenever possible. This interview is usually scheduled during the student’s initial visit to the school. Within two weeks of the family interview, you will be notified about the status of your application.